The Tradewise Gibraltar Chess Festival is a chess tournament held annually at the Caleta Hotel in Gibraltar since 2003. Its eleven days of competition usually run from late January to early February. The main event, the Masters, is open to all, and was voted "Best Open Event in the World" by the Association of Chess Professionals in 2011, 2012, and 2013. The inaugural festival, then known as the Gibtelecom Gibraltar Chess Festival, took place in 2003. Fifty-nine competitors took part, of whom 24 held the FIDE grandmaster title. The 2014 Masters tournament comprised 256 players of whom 68 were grandmasters and 40 held the international master title. The festival also features four five-day tournaments restricted to players below a certain rating. In the 2014 festival there were players from 59 different federations. The Gibraltar Chess Festival is well known for giving particular prominence to women's chess. In the 2014 festival 53 women competitors took part, amounting to 15% of the total field. In 2012 Chinese grandmaster Hou Yifan, at the time ranked number two female chess player in the world, scored 8 points from a possible 10 in the Masters, tying for first place with Nigel Short before losing a play-off match for the first prize. During this event Hou Yifan defeated Judit Polgar, number one rated female chess player in the world from 1989 to her retirement as a professional player in 2014. 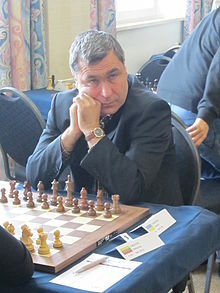 The highest score achieved in a Gibraltar Masters event has been 9 points from a possible 10, made by Vassily Ivanchuk in 2011, with a performance rating of 2968. In 2012, special stamps were issued by the Gibraltar Post Office to commemorate the tenth edition of the chess festival. Since 2011 the Director of the Tradewise Gibraltar Chess Festival has been Stuart Conquest, grandmaster and 2008 British Chess Champion. Former World Chess Champion Boris Spassky has twice been guest of honour at the Gibraltar Chess Festival. Current World Champion Magnus Carlsen has also visited on two occasions. Since 2011 an annual Gibraltar Junior International Chess Festival, also held at the Caleta Hotel, has been organised. It lasts five days and takes place in August. It comprises two events: under-16 and under-12. Since 2007, ties for first place in the Masters have been resolved by a tie-break.